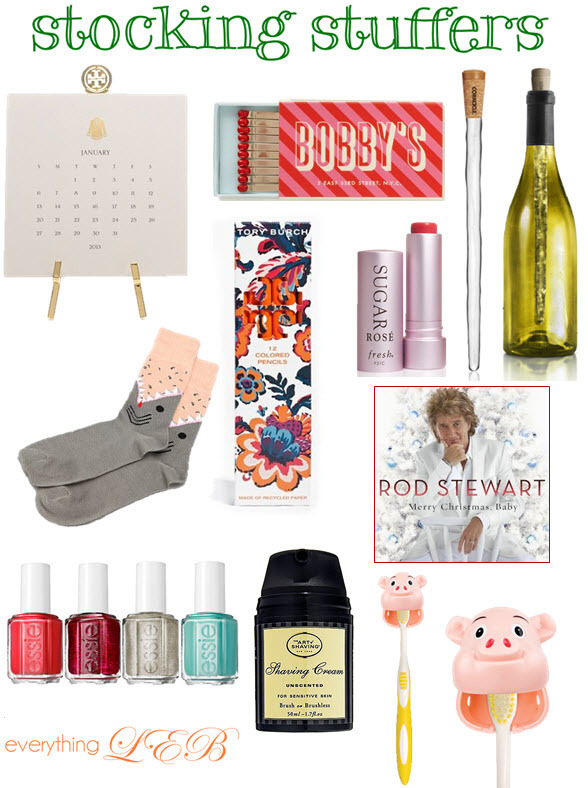 Tory Burch desk calender, Kate Spade bobby pins, Corkcicle Wine Chiller, shark socks, Tory Burch colored pencils, Fresh Sugar lip gloss, Rod Stewart Merry Christmas Baby , Essie Polish set, The Art of Shaving shaving cream, piggy toothbrush holder. I just bought the Rod Stewart CD and I love it- it's getting me totally in the Christmas spirit! Also how cool is that piggy toothbrush holder, I'd love to bring that baby out on girl trips. Come back tomorrow to check out part two of my Stocking Stuffer guide! I am really loving the gift guides this year! I've already purchased a couple of them. I am terrible when it comes to giving gifts so you have been a life saver! And I just purchased 8 corkcicles to give to EVERYONE (including myself). Yes, those socks are hilarious! I love Rod, and the fact that he makes no excuses for his life.